Tuesday, March 25th. 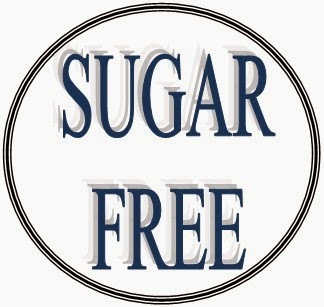 Significant because 20 days ago, my sugar free adventure for lent began. Already, it feels like it's been months. The first two weeks were craziness, as my body adjusted to the less than sweet menu of foods. Headaches daily, constantly felt anxious and every other post on Facebook had a picture of a cake, cupcakes or cookies on it. I guess, for now, I should hide Taste of Home, Pioneer Woman or Williams Sonoma daily recipes. It’s a lot harder than than I could have predicted. Diving into this challenge straight on causes me to wonder did I make the right choice. My reasons were good for trying this, my motivation was noble, my heart was in the right place. But now, my body is cursing and screaming at me from the time I get up, until the time I go to sleep. It's sheer torture walking down each aisle of the grocery store, my eyes landing on everything sweet, wanting to get the calendar out and see exactly which week CAN I buy these for now forbidden foods. My reactions to anything and everything have become so irrational that I don’t even recognize myself some days. Hy-per-sen-si-tive I call it. In fact, every part of my life seems as though it’s under a microscope and all things appear larger than they really are and I’m feeling crushed by them. Headaches persist. Making decisions is difficult, which isn’t usually the case. I’m talking even the small ones, like what to wear in the morning, what to pack for lunch, whether or not I want to pack a lunch, what should I do after work, read a book, watch TV, go workout, clean, play Candy Crush. My emotions feel like they’re on steroids and everyone is a target. I feel bad for my poor husband who has to be in the same room with me when a meltdown occurs. My next thought is, somehow I have to explain this. Never would I have thought that doing without something could wreak havoc on me to the point of wanting to just stay home under a blanket most days. After nearly three weeks I decided that perhaps my body isn't supposed to do without sugar, completely. Perhaps there's a need for some kind of sucrose, fructose, glucose, sugar, or whatever form you like and my system is trying to tell me. So, my plan is to try to introduce something sweet not necessarily sugar in the form we think of it, i.e. the granular sweetness you would spoon into your tea, or add by the cup full to a recipe, or pour over your pancakes. I'm thinking more along the lines of fruit and fruit juice, naturally occurring, not a blend or mix or concentrated or sugar added. Not so much to satisfy the craving for sugar, but to help my body realize it will get the nutrition it needs, so as to achieve a balance once again. So far I have two successfully simple recipes I can share that are delicious. All the while, keeping true to my giving up sugar for Lent. The first one is Apple Oatmeal that I make for breakfast. Simple, delicious, I may make it like this from now on. I use regular old fashioned Oatmeal, the kind you have to cook for 5 minutes. Boil the water and apple juice, vanilla and salt. Stir in the oats. Cook for about 5 minutes over medium heat. Stir occasionally. Add chopped walnuts to cooked oats. At this point you could add raisins if you like. Adding the apple juice actually gives it a light, naturally sweetened flavor, without adding sugar. 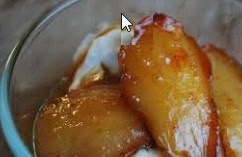 The second one is Baked Pears that I made as a side dish or dessert. I used Bosc pears because of the firm but delicate texture. Place the pears in a single layer in a glass dish. Melt the coconut butter and pour over the pears. Bake in a 375 oven for 15-20 minutes. Turn over occasionally to evenly (lightly) brown on both sides. Use a fork to test. If they are still too firm, add an additional 5-10 minutes more if necessary. Once pears are semi soft, pour in apple juice. Bake an extra 5-10 minutes or until juice is absorbed and pears are lightly glazed from the apple juice. Remove and eat warm. Now I would suggest that any other time of the year, it would be delicious with ice cream on top. Also, I found that since adding a spoonful of sugar to my morning tea isn't on the plan right now, I have had to search for teas that are naturally sweet. My favorite is by Aveda Comforting Teabags or loose tea. The special ingredient in this is licorice root and peppermint, which is very mild and has a sweet aftertaste. You will never want to add sugar to this tea, the taste is impeccable without it. It's caffeine free, so it's a great bedtime tea as well. But don't get the idea that this giving up sugar for Lent is just about food. It isn't. With each and every day that has passed, the temptation is always right in front of me. You just can't turn in any direction and not find sugar, something made with sugar or an ad for sweets. But, rather than consider this a fight to see which part of my conscience would win, I made a decision early on to let these be a reminder of what this season is all about. I try hard not to get obsessive about it, but I am reminded of a religious practice from my early church days. Around this season we would be preparing for the Days of Unleavened Bread. Biblical holyday from the Old Testament, Exodus 12 and Leviticus 23. The teaching in these verses was for the people of Israel to eat unleavened bread for seven days. It was our practice to make sure that before the sun set on the beginning of the first day, every bit of leavened bread was to be removed from our homes, cars, and off our property. This was very much like spring cleaning, only much more OCD. We would search in, around, under and on top of everything in our homes, beginning with the outlying rooms, working our way to the kitchen. And then the hard work would begin. Imagine every place in your kitchen where crumbs could fall, hide, get pushed around, slide under, or get trapped in. These are the places we had to search for and when we'd find them, meticulously remove them by vacuuming, scrubbing, sweeping, or whatever method possible. My house was never, ever so clean as that sacred night when the Days began. And even though it was a bit ceremonial, there was something clean, refreshing, peaceful that happened not just to our homes, but to our spirit. Going through the ritual of cleaning was, well, cleansing. It kept us focused on the purpose of the days, which was to see sin in our lives as these crumbs. They are everywhere and difficult to get rid of. It's a feeling that you've accomplished a huge task, actually rid your entire home of this "sin" stuff and are ready for what's next. Then there was the anticipation of something new, a new season of growth, of church gatherings, of deepening friendships, of gatherings around the table. All for the Days of Unleavened Bread. Which by the way meant the only bread we would eat for seven days were breads made with no leavening, i.e. matzos, wheat thins, homemade breads or desserts. There's an entire recipe book for just this season. A big test came yesterday when Michael and I decided to visit a Maple Syrup house on Maple Syrup weekend. 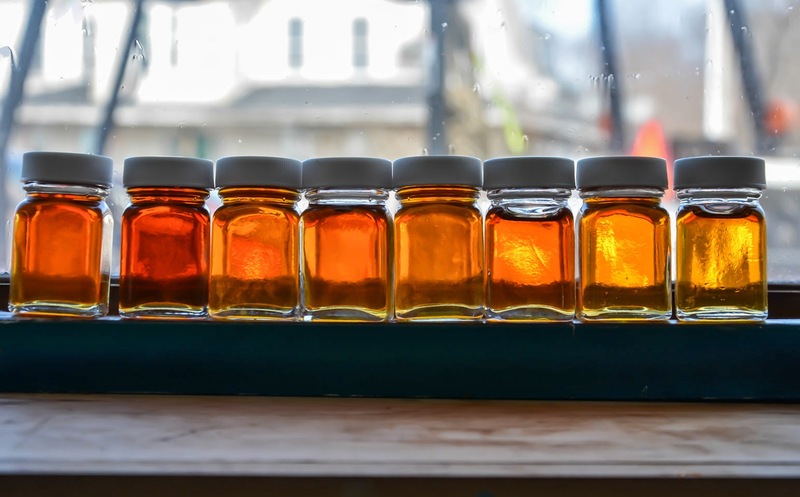 It's traditional for us to find a local farm where maple syrup is being made, take a tour, sample the sweets and purchase a couple gallons of this freshly made deliciousness. As soon as we get out of the car the fragrance coming from the vented boilers blows through the air, always in our direction. Walking into the building, it's warm, steamy and smells just like what I would imagine heaven smelling like, softly sweet, delicately maple scented. Scattered about the rooms are samples of everything maple, maple syrup, maple candy, maple sugar, maple brittle, maple granola, maple milk, maple donuts. And some years, we've gone early enough to enjoy the pancake breakfast, with of course, maple syrup. But not this year. Our afternoon trip to several sugar houses, could have yielded dozens of little samples. And indeed, Michael had his share. I was tempted and conflicted all at the same time. But the one thing that made me say no, was that I'd made a commitment. Would Jesus have been mad at me if I decided to indulge? No, I don't think so. But I did remind myself that there's a purpose for making this decision and I'm going to stick with it. Walking out, I thanked God for such a beautiful hidden treasure he created in the maple trees, and thankful that someone figured out how to bottle it. Oh, and I walked out with my little samples, which are now in a ziploc bag, waiting for Lent to be over. The gallons of syrup I bought will keep all year, there's no rush to taste those. With 20 days to go, I'd like to say I've got this down but I'm not so sure. What I do have is hope that they bring more meaning, more reminders, more connections to what the season represents. It really does need to be about more than just food.